These 2 tables (for Wet and Dry Batteries respectively) show if a battery needs topping up, is suitable for internal use (e.g. under a caravan seat) and for use in an engine bay. Maintenance Internal fitting? Engine bay Fitting? For pricing click on the image. Century N70T (12v, 100Ah). Century Australia's Deep Cycle Flooded (i.e. Wet Lead Acid) range. Constructed with thicker plates, antimonial lead alloys & dense active material for repeated recharge and discharge cycles. E-NEX DC31MF (12v 100Ah). Dual Purpose combination Calcium battery designed for Caravan, RV and marine use. Twin terminals for low current accessories and engine starting. Maintenance Free & very good Value. Store Pickup or low cost delivery. Trojan 27TMX (12V, 105Ah). 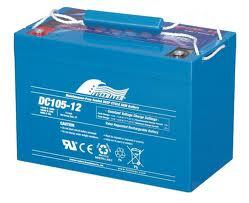 Quality Trojan 12V 105Ah Deep Cycle battery for Leisure applications such as RV's & Marine. Free shipping to most Australian locations. For more information please click the image to the left. Free Delivery. Trojan SCS150 (12v 100Ah). Quality Trojan 12V 100Ah Deep Cycle battery for Leisure applications such as RV's & Marine. Free shipping to most Australian locations. For more information please click the image to the left. Free delivery. Price Brand Dry Sealed Maintenance Free Batteries Maintenance Internal fitting? Engine bay Fitting? A 12V 100 Amp - Hour fully sealed Deep Cycle battery. New low cost good value AGM for normal RV use. A 12V 100 Amp - Hour fully sealed Deep Cycle battery. A very well known brand, offered for the price of a cheap "no-name" battery. Full River DC105-12 AGM Deep Cycle Battery: Top quality and extremely popular range of 12Volt AGM deep cycle batteries. Fullriver are very well respected and proven in RV /Caravan & Marine use around Australia. Highly recommended. Ultimate 100Ah Deep Cycle AGM Battery AGM Deep Cycle Battery designed by Haze for applications such as Motorhomes & Marine Twin posts & CCA ratings for occasional starting. Lifeline GPL-27T 100Ah AGM Deep Cycle Battery. Probably the best all round AGM batteries in the world, Lifeline are made in the USA by Concorde. Original equipment on top-end RV's and Marine craft, they come with a 5-Year Warranty. Rated at 1,100 Cycles at 50% Depth of Discharge, only 2% per month Self discharge and can accept 100% of its rated capacity on charge! An excellent AGM choice. Free Delivery.